Marieke Rosenbaum, V14, MPH14, MS14, has found a unique approach to combine her interest in human and animal health. With a dual degree in veterinary medicine and public health, Dr. Rosenbaum effectively works to improve public health in low- and middle-income nations, while nurturing students to have a positive impact on global health. Dr. Rosenbaum, at bottom left, with the DVM/MPH student group. A recent Cummings School alumna, Dr. Rosenbaum returned to the veterinary school after working as a small animal veterinarian for about a year. She now serves as the DVM/MPH pathway leader and is a faculty member for the Master of Science in Infectious Disease and Global Health program. Veterinary medicine was always something Dr. Rosenbaum wanted to do. Her love of wildlife and conservation started at a young age when her dad, who was a landscaper, brought home orphaned animals. When the time came, though, her path to finishing veterinary school was not typical. 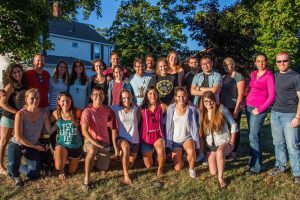 She took a few detours along the way, all of which provided a broad spectrum of experiential learning and knowledge that she brings to her work and to her students at Cummings School. During the summer after her first year of veterinary school, Dr. Rosenbaum had an ‘aha’ moment. Although she realized that she didn’t want to spend her professional life in a lab, she wanted to learn more about laboratory technologies. 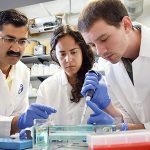 Between her second and third year of vet school, she took a pause and pursued a master’s degree in Comparative Biomedical Sciences, completing her thesis under the direction of internationally renowned faculty member Andrew Hoffman, DVM, DVSc, DACVIM, Director, Regenerative Medicine Laboratory (RML). 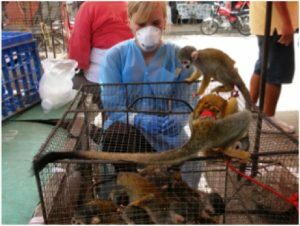 As a Fogarty scholar, Dr. Rosenbaum spent time in Peru studying infectious diseases such as Tuberculosis, in nonhuman primates involved in the wildlife trade. 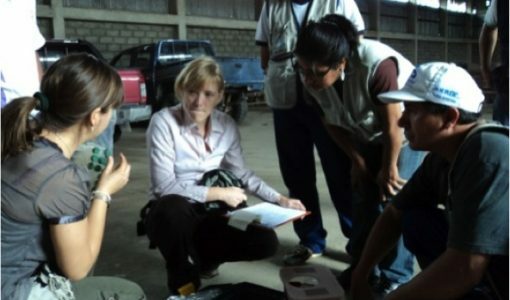 Dr. Rosenbaum returned to the DVM/MPH program for her third year, but took another detour when, as a NIH-funded Fogarty International Clinical Research Scholar, she spent the next two-and-a-half years in Peru gathering data on the transmission of infectious diseases between primates and humans during wildlife trafficking. Her goal was to support policy development related to the wildlife trade in Peru and demand more attention to it from the authorities. A passion for the public health arena stems from Dr. Rosenbaum’s ability to combine her interests in infectious disease, global health, zoonotic disease, population health, and the interactions between them. She finds them complex, yet fascinating. Dr. Rosenbaum returned to Cummings School to finish her DVM/MPH degrees in 2014, and while she is a recent graduate, she is also a seasoned leader with significant hands-on experience. “[My time as a Fogarty Fellow] gave me a lot of experience with research, team leadership, and doing fieldwork,” she says. Dr. Rosenbaum knows firsthand what her students need. She actively involves them in her research, including recent projects studying lead exposure for chickens living in urban coops, exploring how disease resistance is transmitted from humans to rodents, and how living with production animals may affect the gut flora and stunting in Guatemalan children. 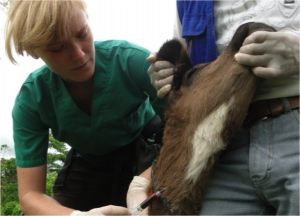 Dr. Rosenbaum collects a blood sample from the jugular vein of a goat in the high jungle in Peru to test for Leptospirosis, a zoonotic disease that is endemic to rice cultivators in this region. 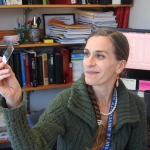 She helps MSIDGH students understand and get comfortable with real-world laboratory work—including what it’s like to set up, run, and follow an assay from start to finish. “It can really make or break their desire to stick with the field. 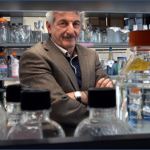 At times you need to go to the lab early in the morning, late at night or even on the weekends,” says Dr. Rosenbaum. It was not too long ago that she was in their shoes, so she also understands the critical role a faculty mentor plays for a student engaged in his or her first research project experience. “Dr. Rosenbaum encouraged me to work independently and perform each step of the bacteria culture from start to finish. Because of this, I was able to truly expand my microbiology skills,” says Cassidy Riekofski, MSIDGH ‘16, who had Dr. Rosenbaum as her mentor. A proponent of an “open door,” Dr. Rosenbaum advocates for the importance of positive reinforcement as students learn and explore career choices, and she collaborates with them to find their own personal approaches to promote human, animal and environmental health. “As my mentor, she was an invaluable resource, providing feedback on my poster presentation and research proposal—not just one draft, but many. She always made time for me,” says Riekofski.